Through exploring the contemporary quotidian realities for young women in Coastal Kenya, students develop insights and skills for analyzing how complex socio-historical dynamics impact opportunities and challenges. 1. Learn about the history of Coastal Kenya with an emphasis on gender and intergenerational relationships. 1. Be able to discuss some of the complex social dynamics young women in Kilifi confront and better understand choices they have. 2. Compare situation of adolescent girls in this setting to other situations to consider whether processes or themes are generalizable or specific to the local place and time. Choose other background readings as appropriate from the accompanying bibliography on Girls and Adolesence in Coastal Kenya for this lesson. Explore the web site of organization, Moving the Goalposts. Lecture using the powerpoint. Modify as needed for your classroom use. Identify other life histories of teenage girls. How specific to place/time are the circumstances the girls face? See the Bibliographic Search Guide. Bame Nsamenang. 2002. “Adolescence in sub‐Saharan Africa: An Image Constructed from Africa’s Triple Inheritance.” In The world’s youth : adolescence in eight regions of the globe, ed. B. Bradford Brown, Reed Larson, and T. S Saraswati, 61–104. New York: Cambridge University Press. C. Write of a review of current research trends on the topic of adolescent girls comparing two different regions, countries. Video: Mabinti. MTGK. 2009. Kilifi, Kenya. Also on Youtube. 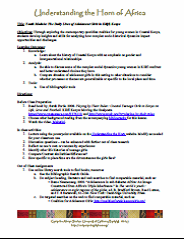 Bibliography created for this unit.